Relative sizes of various tunas tuna on Wikipedia. Any of several species of fish of the genus Thunnus in the family Scombridae. The edible flesh of the tuna. 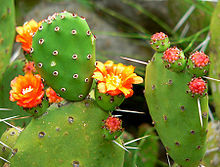 The prickly pear, a type of cactus native to Mexico in the genus Opuntia.